Macrocycles possess potential applications in supramolecular chemistry and biosystems. Thus development of new kinds of macrocycles is of significance. Herein, novel macrocycles containing Se-Se/Se-S bonds were synthesized via transformation be-tween selenium related dynamic covalent bonds. A monomer containing two ebselen moieties was synthesized (M1). The Se-N bonds in M1 was reduced by dithiothreitol, forming Se-S linked dimer (D1). 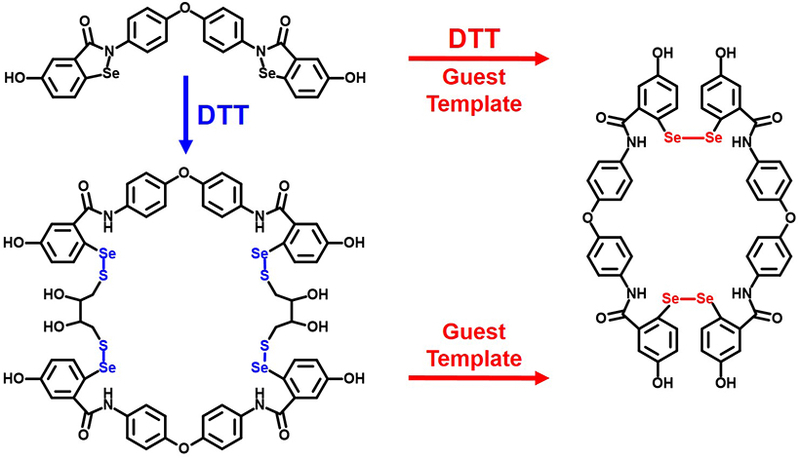 To realize the transformation from Se-S bonds to Se-Se bonds, guest molecules were added as template, triggering the formation of Se-Se linked dimer (D2). The formation of these two new kinds of macrocycles was determined by 1H NMR and 77Se NMR, and the necessity of guest molecules was also confirmed. The introduction of ebselen moieties and Se-S bonds or Se-Se bonds into macrocycles may endow it with new re-sponsiveness and bioactivities, as well as new types of host-guest chemistry.